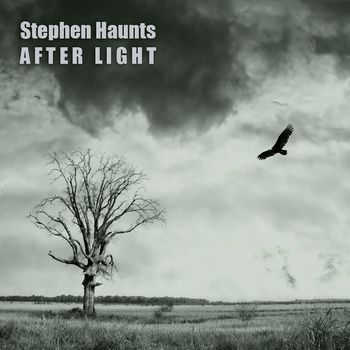 Stephen Haunts has recorded for a number of years under the moniker Creature, turning out interesting music combining IDM structures with otherworldly circuit-bent sounds. Stepping out under his own name with After Light, Haunts has put together a challenging disc that is black-hole dark and borderline industrial. Sub-bass drones, manipulated field recordings and noise are brought together to affect the listener physically. On the back of his case, Haunts describes the music as “frightening.” Truth be told, it almost scared me off. I like Stephen’s work and I find his adept hand at sound creation quite fascinating, but I struggled to get into After Light. And it’s not a case of thinking, “Well, this doesn’t sound like Creature.” It’s perhaps overly dense for me, and some of the soundwork pulls me out. There’s an effect late in “A Lonely Storm” that, quite frankly, sounds like Haunts has unleashed a demonic cow. I was working my way through the track, getting to understand it and liking it and–boom. Demon cow, and I’m pulled out of the flow, wondering what that was. From a dark ambient standpoint, After Light is in the right vicinity. It’s low in register throughout, veritably snarling its way through its six tracks. It’s as grim as you can handle, absolutely unwavering in its darkness and it definitely has the physical impact Haunts is looking to create. A lot of thought has clearly gone into the sources brought in, and Haunts manages and layers them well. But as always, this is one listener’s opinion, and someone more inclined to noise manipulation and classic-style industrial may see more here than I do. If that’s you, I definitely recommend going to Haunts’ web site for a listen. Available from Haunted House Records.